our perfectly imperfect life: Ball. Ball. Ball. When Payton was born and diagnosed with Down syndrome, I cried and cried thinking about what the future would hold for her. 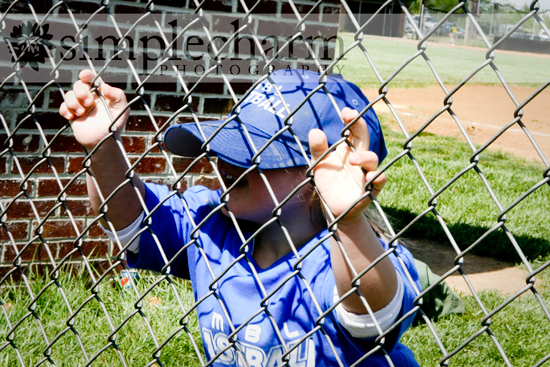 Mostly, the tears fell when I wondered whether or not she would have friends, whether or not she would be made fun of for being different, whether or not she would play sports like her brother ... whether or not she would be accepted for who she is. As she approached four years old, my anxiety grew over enrolling her in dance programs or sporting events. I knew ... had she been born without that extra chromosome ... that I would have enrolled her in all of those extra-curricular activities without a second thought. But I stalled with Payton. Because I didn't want her to be an outcast. 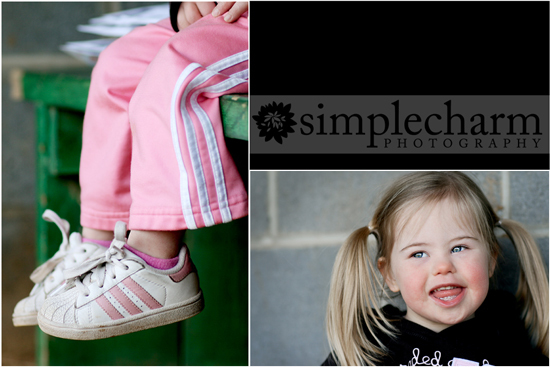 I didn't want her to be "that girl with Down syndrome". I didn't want her to be subject to stares. I just wanted her to be accepted and I feared it would not happen like I had hoped. And then someone smacked me upside the head. And I saw how excited Payton was when she played "ball". How could I withhold that from her in light of my own insecurities? 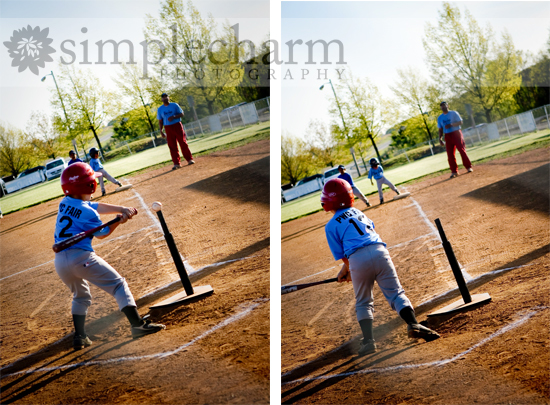 So I told my husband I'd enroll her in blastball ... the level before tball ... if he coached. Ha. Nobody messes with the coach's daughter, right? Ha. She winds up, she swings and she hits the ball! And the base squeaks -- err, blasts -- when the kids step on it ... hence the blast in blastball. She fields the ball ... and she throws! Enough with practice ... it is game time! Payton has done awesome playing blastball. She might not understand the game at the same level as the other kids, but sitting there watching her do what she is supposed to do ---> PRIDE. Pure pride beyond words to even explain. 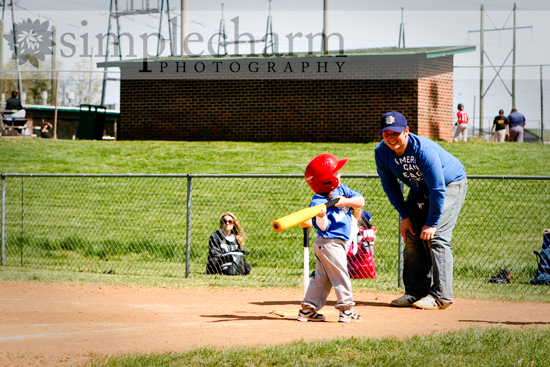 I have always been so proud of Mason and all that he has done in tball, but Payton ... it is so different. So, so different. This chick has my heart. Sassy as she is. Uhh Chicky ... aren't you supposed to be out there playing ball? Mason has deemed himself Assistant Coach of Payton's blastball team. And man ... he is so proud of himself ... and his sister. He was quite miffed to learn that he didn't get a team shirt though ... after all, shouldn't the Assistant Coach get a shirt? 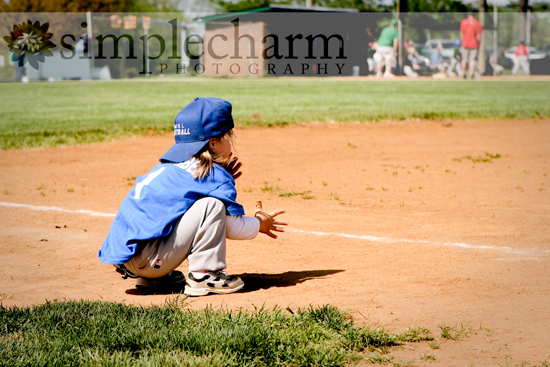 Lucky he has one of his own ... for his own tball team. We have always thought Mason was really good for his age. Parental bias, I suppose. Until the other day we received an email from his coach asking if we would mind if they moved Mason up to the next level ... the Rookies. We told them we would be honored ... we will see what happens. Mason is a big kid. A big kid. My husband has always made fun of the way I run ... apparently I "don't know how to run". Whatever. Sadly, I think Mason has the same problem. Poor kid. I don't think he quite knows how to handle his cute-little-large-self when he needs to move faster. 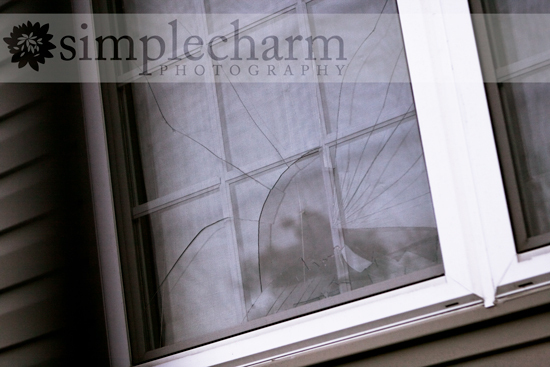 Is it true that with every baseball player comes a broken window? I totally just made that up. Mason and his father were hitting balls in the backyard yesterday. SMASH. Uh ... they were in so much trouble! Mason hit the ball and knocked out the window in the far corner of the house ... he definitely has a good swing, I guess? Little stinker. Do I make him or his father pay? Ha. And for now, Nika is happy keeping the bench warm in the dug out. Looking cute, watching her brother and sister play "ball". I loved reading this, Bethany! Although Owen doesn't have Down Syndrome, when we adopted him, I had many of the fears you did because he was so incredibly delayed and different and just in his own little world. To watch him even stay on the soccer field and attempt to score a goal brings so much joy and pride to my heart. Congratulations to Mason and to Payton too! I have totally had those same fears! I have never heard of blastball. I've been thinking of enrolling Ella in dance, but I am scared..... 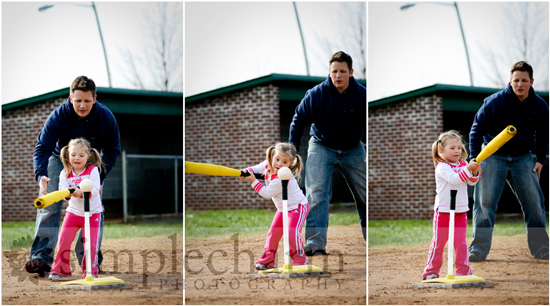 I would love for her to eventually play ball, I loved it growing up, she is just so dang small. The pictures are wonderful, brought a tear to my eyes seeing Payton playing!!! Same fears here too.I fear someone will make fun of Em..then I have the fear of landing myself behind bars. But on the other hand I want and Emmie needs to experience as much as she can. 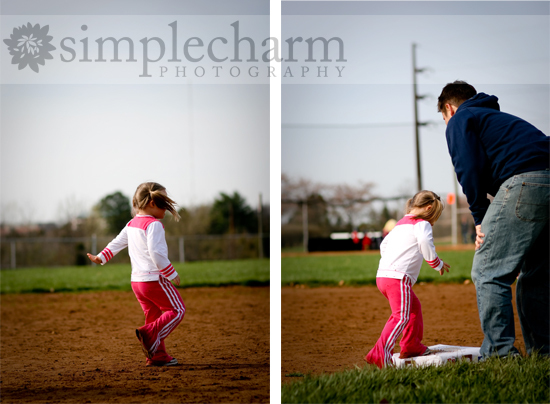 Thumbs up to your hubby for stepping up to the plate like that! Adorable pics! I totally get the extra pride...parenting kids with special needs is sooo underrated! Extra pride comes with that extra 21st! i'm sitting her smiling reading this!!! 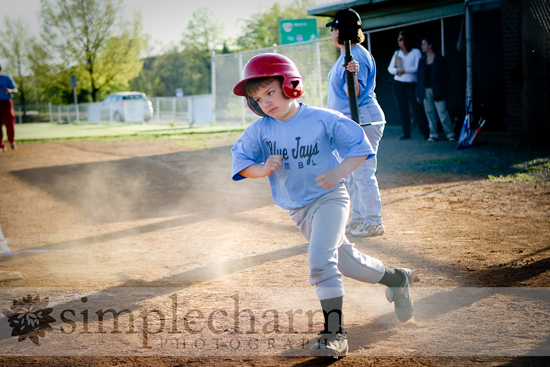 i love the t-ball pictures. isa has the same glove. This post brought tears to me eyes...Just last night I was at Nathan's soccer practice with Nicholas and thinking "Will Nicholas ever play soccer? Will it be with typical kids?" I really hope so, but I am scared too (for the same reasons you were). It is so nice to see Payton playing baseball, and it really gives me hope! Looks like so much fun!! Great post! I have those same fears for Lindsey. Guess I will have to remember these pictures in a few years. 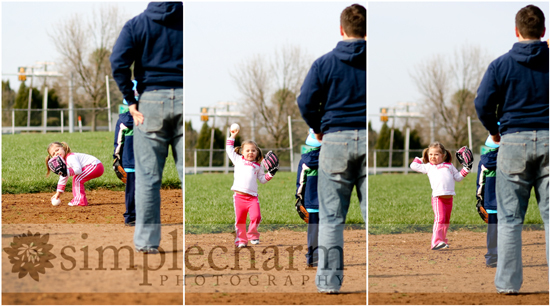 They look great playing t-ball and Nika does make an adorable bench warmer. I loved this post!! Good for you for enrolling Payton in Blastball. It looks like she loves it! Great pictures! That is sooo great! LOVE the pictures! "Yay" for Payton and "yay" for YOU for stepping out of the way and giving her a chance to shine! I have Aleena in dance - her 2nd recital is coming up! Team sports scare me, though. She loves to run, so I'm looking ahead to when she is 8 yrs old and can participate in track type events in the Special Olympics. But, did I say team sports scare me? The coaches . . . the other parents . . .